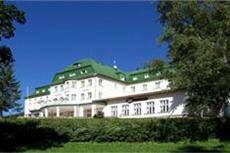 Discover all that spindleruv Mlyn has to offer with Palace Club Hotel as a base. The Palace Club Hotel boasts a convenient location with modern amenities in every guestroom and superb service. In-room facilities include non smoking rooms, television, shower, separate shower and tub, mini bar, satellite/cable TV.This spindleruv Mlyn accommodation features on-site facilities such as elevator, bar/pub, meeting facilities , restaurant, safety deposit boxes, business center, bicycle rental. In addition, the hotel's guests can enjoy the leisure and sports facilities provided on the premises: massage, jacuzzi, sauna. This hotel is characterized by a combination of modern comfort and traditional element of spindleruv Mlyn, making it a distinct accommodation. Make your reservation at the Palace Club Hotel spindleruv Mlyn now by selecting your chosen dates of stay and submitting our secure online booking form.